North Craven prime lambs took championship honours at a well supported and high quality July show at Skipton Auction Mart, (Mon, July 2) which saw recent improved trading levels maintained. 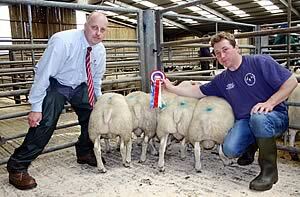 Skipton July prime lamb champions. Richard Caton, of H Caton & Sons, Neals Ing Farm, Stainforth, clinched the title with a five-strong pen of 40-kilo Texel-cross lambs, purchased for the day’s top price of £67 per head (168p/kg) by Mick Etherington, on behalf of Stuart Price Butchers, of Crossflatts, Keighley. Price’s Butchers is a regular buyer of Skipton prime lamb champions and the latest acquisitions will be going on sale to appreciative customers at the Lime Court shop from Thursday, July 12. Stuart Price said: “We are great believers in procuring locally produced, fully traceable top quality lambs and other meat products through recognised, reputable sources at every opportunity. The reserve championship went to David Hall, of Church Close Farm, Coniston Cold, who won the overall title at the June show of prime lambs, sold for tables at his neighbouring Coniston Hotel through a true gate-to-plate local supply partnership. David’s July runners-up, a pen of 38-kilo Rouge-cross continental lambs, made £55.50 each (146p/kg) when bought locally by Ross Greenwood, of Carleton.